Billet aluminum and stainless steel top yoke Nut to fit '01-'15 Yamaha SR and SRX. Billet aluminum and stainless steel top yoke nut to fit the late model Yamaha SR (2001-2015) and Yamaha SRX. Reminiscent of a steering damper off a British cafe racer from days gone by. 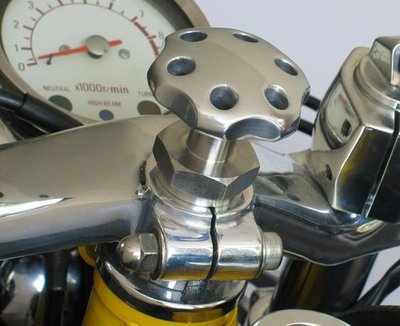 This top yoke nut will give your SR (2001-2015) or SRX a classic cafe racer look. This is designed to be used with clip-on bars. This item is finely crafted in two pieces. 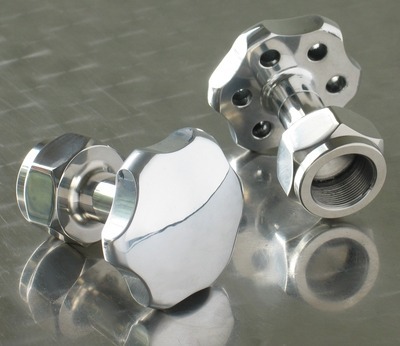 The lower nut is machined from solid billet stainless steel. 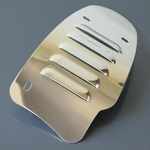 The knob is machined and polished aluminum alloy. Available with or without lightening holes.